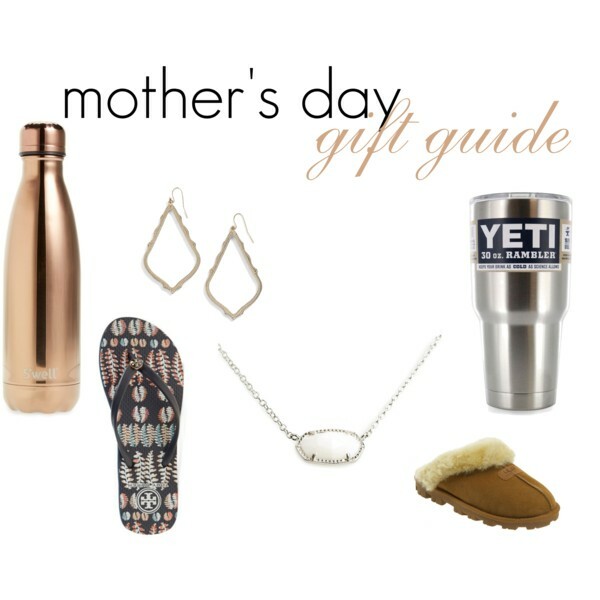 The hubs was just asking me what I wanted for mother's day…we don't usually exchange gifts and for Mother's day I'm more of a sentimental type but thought I'd still come up with a few great gift ideas;) Buying for my mom and MIL is always hard for me….Deciding on a good gift that they will love is tough..
Yeti-I mean what mom wouldn't want a Yeti cup to keep her water cold all day. I love the coffee mug size too, since I never seem to be able to actually finish a cup of coffee while its still hot. I think I microwave mine a minimum of 10 times before its gone. Ugg slippers- I got these around Christmas and have talked about them tons but they are absolutely a must have! I wear them EVERY day. So comfy, so perfect for mommas. Necklace|Earrings-what momma doesn't love a fun, simple necklace she can throw on with anything. I have been on the search for a simple necklace and some simple earrings for ages and these two fit the bill. Flip flops- I also don't know a mom that doesn't love Tory Burch. Love these fun flip flops for summer. Hello sunshine and summer!